Barium does not occur naturally in its pure form, because of its reactivity. 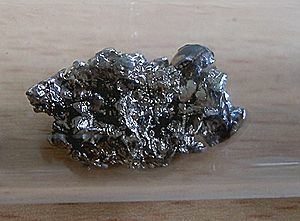 It is an alkaline earth metal. The most common barium mineral is barium sulfate, or barite. It has many uses including spark plugs, fluorescent lamp electrodes, glassmaking, rubber production, green fireworks, and others. The leading application for barite is as a weighting agent in natural gas and oil field drilling muds to suppress high formation pressures and prevent blowouts. As a well is drilled, the bit passes through various formations, each with different characteristics. The deeper the hole, the more barite is needed as a percentage of the total mud mix. An additional benefi t of barite is that it does not interfere with magnetic measurements taken in the borehole, either during logging-while-drilling or in separate drill hole logging.A switch from coal to natural gas in new powerplants would likely provide a boost to domestic drilling and increase the demand for barite. In 2009, there were four active barite mines in Nevada桞ig Ledge Mine (NOV Minerals LP, formerly Spirit Minerals LP) and Rossi Mine (Halliburton Energy Services-Baroid) in Elko County, and Argenta Mine (Baker Hughes Drilling Fluids) and Greystone Mine (M-I L.L.C. operating as M-I SWACO) in Lander County. In addition to these Nevada operations, there was one small barite producer in Georgia桸ew Riverside Ochre Co., Inc. Domestic Production and Use: Domestic producers of crude barite sold or used for grinding an estimated 670,000 tons in 2010 valued at about $36 million, an increase in production of 75% from that of 2009. Most of the production came from four major mines in Nevada followed by a significantly smaller sales volume from a single mine in Georgia. In 2010, an estimated 2.7 million tons of barite (from domestic production and imports) was sold by crushers and grinders in 10 States. Nearly 95% of the barite sold in the United States was used as a weighting agent in gas- and oil-well drilling fluids. The majority of Nevada crude barite was ground in Nevada and Wyoming and then sold primarily to gas-drilling customers in Colorado, New Mexico, North Dakota, Utah, and Wyoming. Crude barite was shipped to a Canadian grinding mill in Lethbridge, Alberta, which supplies the Western Canada drilling mud market. The barite imports to Louisiana and Texas ports mostly went to offshore drilling operations in the Gulf of Mexico and to onshore operations in Louisiana, Oklahoma, and Texas. Barite is also used as a filler, extender, or weighting agent in products such as paints, plastics, and rubber. Some specific applications include its use in automobile brake and clutch pads and automobile paint primer for metal protection and gloss, and to add weight to rubber mudflaps on trucks and to the cement jacket around underwater petroleum pipelines. In the metal casting industry, barite is part of the mold-release compounds. Because barite significantly blocks x-ray and gamma-ray emissions, it is used as aggregate in high-density concrete for radiation shielding around x-ray units in hospitals, nuclear powerplants, and university nuclear research facilities. Ultrapure barite consumed as liquid is used as a contrast medium in medical x-ray examinations. Import Sources (2006�): China, 95%; India, 3%; and other, 2%. Events, Trends, and Issues: In April 2010, the explosion of the Deepwater Horizon drilling rig and subsea blowout of the Macondo oil well in the Gulf of Mexico resulted in the largest offshore oil spill in U.S. history. A 6-month moratorium on deepwater drilling was declared by the Government in late May and lifted in October after the U.S. Department of the Interior introduced new safety standards for operators drilling in water depths greater than 152 meters (500 feet). The drilling moratorium and more stringent regulatory reviews of shallow-water drilling applications reduced offshore drilling operations in the Gulf of Mexico, which resulted in a decrease in barite sales and consumption in the Gulf of Mexico. In mid-April (before the moratorium) there were 55 drilling rigs operating in the Gulf of Mexico, but by mid-July the number had dropped to 12. Deepwater wells require much larger amounts of barite than most onshore wells because of deeper drilling depths and higher pressures, so this small decrease in operating rigs had a significant impact on Gulf of Mexico barite sales. Some experts estimate it could take 2 years for oil and gas production in the Gulf of Mexico to return to pre-spill levels. Nationally, the rig count of operating drill rigs increased during 2010 as the oil and gas industry increased exploration activities after oil and gas prices recovered from their lows during the 2008� recession. The monthly rig count of operating drill rigs increased by nearly 500 between December 2009 and October 2010, and was led by Texas, with an additional 250 rigs operating; North Dakota, with an additional 66; and Oklahoma, with an additional 45. Bad weather in China (drought conditions in the winter and early spring, and flooding in the summer and fall) hampered production and shipment of barite during 2010. Much of China抯 barite resources are in the provinces of Fujian, Guangdong, Guangxi, Guizhou, and Hunan in southern China, which was the region hit hardest by the adverse weather. India, the world抯 second leading barite producer, also experienced weather-related problems in its barite mining industry as its major barite mine in Andhra Pradesh was flooded by late summer monsoon rains. The lower part of the mine that produced higher quality 4.2 specific gravity product was flooded. China and India normally account for about 70% of world barite supplies, and weather-derived problems were expected to adversely affect world supplies of barite in the latter part of 2010 and apply upward pressure on prices. World Resources: In the United States, identified resources of barite are estimated to be 150 million tons, and undiscovered resources include an additional 150 million tons. The world抯 barite resources4 in all categories are about 2 billion tons, but only about 740 million tons is identified. Substitutes: In the drilling mud market, alternatives to barite include celestite, ilmenite, iron ore, and synthetic hematite that is manufactured in Germany. None of these substitutes, however, has had a major impact on the barite drilling mud industry. eEstimated. Solvay SA (EBR: SOLB, OTC: SVYSY) is a Belgian chemical and pharmaceutical company that specializes in ultra-pure barium carbonate. American Elements - http://www.americanelements.com/ba.htm - Barium acetate, barium bromide, barium bromide, barium carbonate, barium chloride, barium fluoride, barium hydroxide, barium nitrate, and barium sulfate. International Isotopes (OTC: INIS) - http://www.intisoid.com/?page_id=3 - Provides radiochemical products including barium-133, cobalt-60, cobalt-57, and iodine-131. Bass Metals (ASX: BSM) - http://www.bassmetals.com.au/ - Fossey Zone barite deposit in Tasmania.